= Are we having fun? / Are you ready to rock? = You are hyped up, Sensei! Hi everyone! Do you like my new wig? As many other slang words, we usually write these in katakana. But you can use it when someone is going along with “the beat”, “the groove” or “mood” as well. = low key attitude, not enthusiastic, not go along with the happy mood around you, not to get into something easily, party pooper. When do we use ノリ ( = nori) or ノる ( = noru)? ノリのいい音楽 ( = nori no ii ongaku), upbeat, groovy music that makes people get into the swing or feel like dancing. = Kono kyoku nori ga iine! = Kinō Maggie sensei , konnsaato de norinori dattane. = Maggie Sensei was very hyped up in the concert yesterday. = Kinō no raibu minna chou norinori dattayo. = Everybody got so hyped up at the live concert yesterday. = Kare wa hitori norinori de odotte ita. = He was dancing crazy all by himself. = Are we all having fun? / Are you ready to rock? is a cliché line that is usually used in a rock or pop music concert. The vocalist shouts out this line in the middle of the concert. Note : かい ( = kai) ending is for a question and a male speech. Ex. 覚えている？ ( = Oboete iru) Do you remember? 4) to describe someone who can interact with people in a funny way or someone who responds to someone’s jokes or gags quickly, or people who can adjust to the happy mood around them and go along with the jokes easily or is willing to participate some fun (or sometimes crazy) activities. = Kare wa nori ga iine. = He is funny / He can respond quickly. / He is quick witted./ He rocks! = kyō no okyaku san wa nori ga ii. The audience was really into our performance/music. = Aitsu wa nori ga iikara nomikai ni yobu to ba ga moriagaru. = He (That guy) is the life of the party so if we invite him to our drinking session, he cheers up the atmosphere. 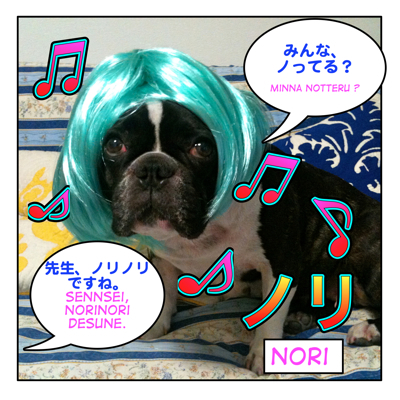 So usually ノリ ( = nori) or ノる ( = noru) is used for some fun situations or to describe music with a beat but there are some cases you can use for other activities. 5) When someone is motivated to do something, to be into the groove, to get into a gear. = Shiken benkyō noranai kara asobini ikō yo! = I don’t feel like studying for the exam so let’s go out! = Asa kara shigoto notterune. = You have been working very efficiently since the morning. = Kanojo wo karui nori de sasottara honki ni sareta. = I just asked her out casually but she took it seriously. = Karui nori de yatta koto dakara yurushite. = Forgive me. I just did it as a joke without thinking. = Ag! Dandan notte kita!! = Oh now she is getting into it. Sometimes it requires a lot of energy to please humans. Could you, if possible, tell me what means Sノリ王子と, i found this tricky and confuse. Thank you in advance. I am sorry. I wish I could help you but I have no idea. “S” could be an initial of her prince and follows のり as a part of his name. In other word, there is no such a word, Sノリ王子 in Japanese. It is a coined word. Thank you for the response. Yeah, that’s hard. Thank you again, I gonna trying to figure out. I hope you can find the answer somewhere. I checked that song and I think – like Maggie said – Sノリ王子 refers to a person and has rather nothing to do with the ノリ slang word. It might refer to Nissy. Wow. Yeah, it could be. Thank you 天人. I was thinking that could be S (sea) nori (weed). So, seaweed as Snori. Seaweed Prince. Ok, that’s ridiculous, but…hahaha. OMG! It’s really helpful. I couldn’t understand the meaning no matter how I read the dictionary again and again. Your explanation is so clear. Thank you. You saved me. I am glad to hear this lesson help you understand the meaning. It depends on the context but how about (〜を or ~が)習えてよい(or いい）/ 学べてよい（or いい）? I’m trying to read some Japanese texts everyday (tho I don’t really always understand it), but I’m really bad at hearing… What can I do for better recognizing Japanese sounds? It’s good for you to study Japanese everyday. As for hearing, besides all the language course listening materials, you can use any Japanese videos using youtube or somehting. Find a drama, anime or anything you like. Some of them have subtitles. Pick any scene and focus on hearing what they are talking about even just 30 seconds everyday. Try to write down every single word that you hear and check it with the subtitles. NHK also offers やさしい日本語(I once in a while retweet their tweet) They read a news along the text and you can check the vocabulary as well. ne sensei, wht does “ノリ気じゃなかったのに” mean? 先生 will be back soon, so I will answer your question instead. ノリ気（乗り気） means “interest; eagerness; enthusiasm” and じゃなかった is its negation in the past. Therefore the speaker wasn’t in the mood for doing something, but he/she (probably) eventually did it. のに expresses feelings like 不平・不満・恨み・非難. Haha! You must have thought your friends just loved seaweed! thank you for the wonderful lesson- this is so useful.! without changing the meaning? is the first one just more slangy? Ah, OK, メイクのノリがいい／悪い is different from ノリがいい／悪い. 化粧（けしょう）／メイクのノリがいい means make-up goes on smoothly. When you have a nice smooth skin condition, your skin absorbs all the make up cream, lotion, foundation, powder etc. well and you look good after wearing the make-up. We often omit ”い” in casual Japanese. Hi Maggie! I am Italian, I started studying Japanese 2 years ago and I love it! I have just found your blog and I love it too! It is nice, fun and very useful….Maggie Sensei rules!! ;-) Ciao! Hello Annarita!! Thank you for comment. I am very happy that you found us in Italy!! Hope you come back soon again!! Feel free to leave a message or questions here anytime! （I am not sure if you want me to correct this comment as well but…I will do that anyway to help your Japanese…. OK,I can help your Japanese. Are you ready? →so you should use きたい in this case. I can always help your Japanese on Twitter,too! I just found your blog マギー先生! Haha, that’s different, nori. →海苔= nori= seaweed!